On one of the Medeira Islands, Iron Man, Invisible Woman and Captain America are battling giant monsters as they come from the ocean. Failing to stop them, Captain America decides to call in the other Avengers to help. At Avengers Headquarters in New York City, Nova's communicator beeps but he chooses not to answer it. He has uncovered vital evidence that proves one of the team is an imposter! Three hours earlier, Nova, Vision and Carolina Pissarro begin their investigation of the other Avengers. Rich wants to be Watson while the Vision would be Sherlock Holmes. He points out that the Vision is better at deduction while he is the one who gets the girls. Victor points out that there is only one girl around and Carolina is his girlfriend. Richard Rider informs the Vision's female companion that during his trip to Asgard, he learned from Odin that one of his teammates is not who he or she appears to be. The two Avengers go through the membership and eliminate as many as they can from the list of potential traitors. They decide that Odin would have known if Thor was an imposter. Nova trusts Captain America and feels that Iron Man (as Tony Stark) is too public a figure to have been replaced. The Vision concludes the Invisible Woman is too experienced and the Black Widow is too unique in her fighting manner to be imitated. With all the Avengers eliminated by their instincts, they decide to use detective work to figure out who it could be. 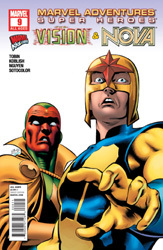 The Vision and Carolina begin the searches with Nova's room. Rich is extremely embarrassed that his area hasn't been cleaned. The Vision's girlfriend offers to set up a blind date for him with a musician friend of hers since they both like music. It would also give him a reason to clean his room. Ten minutes later, Nova pushes them out of his room and over to Victor's area. Inside, Carolina learns that the Vision has placed one of her paintings above his desk. She is very happy to see it and feels he is very romantic. Rich is even more embarrassed. As they head towards Iron Man's room, the Avengers full alert alarm goes off! Nova and Vision are joined by Captain America, the Invisible Woman and Iron Man. Sue Storm informs the other two Avengers that they have received an emergency call from Atlantis. A volcano has disturbed a group of ancient sea monsters and they are headed towards the undersea kingdom. Sue, Steve and Tony race to fight the monsters with Rich and Victor staying behind to handle any other emergencies that arise. It also gives the two teammates more time to search the rooms. One hour later, the Avengers quinjet approaches the sea monsters. Captain America calls the Sub-Mariner to announce their arrival and offer their help. Namor refused the assistance and orders them to leave their sovereign waters. They agree to his demands. However, the monsters are still about two hours away from Atlantis territory. The team decides to try and stop the monsters before they get to Atlantis. Back at the Avengers mansion, the Vision phases into Iron Man's room in order to bypass Stark's hi-tech security system. While they wait outside the room, Nova and Carolina discuss her friend and the possibility of the four of them going on a double date at a cello recital. Rich starts banging on Stark's door and telling Victor to hurry up. Elsewhere, Iron Man, Captain America and the Invisible Woman continue to evacuate the people on the islands which are in the path of the sea monsters. Steve wonders where the creatures have been hiding for years. Sue recalls the Sub-Mariner telling her that Atlantean nobles used the beasts as their personal armies centuries ago. Since the practice was outlawed, the monsters have been asleep under the sea. She also points out that a single nap can last decades. Cap regrets not learning any lullabies. In the mansion, the trio are in Thor's room looking for clues. Although they have logically eliminated the god of thunder as a suspect, Nova couldn't resist taking a peek. The room is full of ancient relics. Rich marvels at the idea of Thor's clothing being centuries old but were new when he bought them. On the island, the three Avengers have failed to stop the monsters. Sue contacts the Sub-Mariner to inform him of their failure and the approaching danger heading towards Atlantis. Namor thanks them for their efforts and leaves to take care of his people. Meanwhile, in Captain America's quarters, Nova has found a photo of Steve Rogers shaking hands with Franklin Delano Roosevelt. They are a little surprised to also find a photograph of Steve with Sue Storm. Rich dismisses it as a friend simply having a picture of another friend. They decide to search the Invisible Woman's room next. Carolina finds it interesting that Nova is checking rooms in order of those least likely to get angry at him. She also concludes Rich finds strong women scary since Sue and Natasha are the last two to be searched. Fifty miles from the Madeira Islands, the Avengers are still attempting to find a way to divert the sea monsters. Sue realizes the creatures began their march due to the irritation caused by the volcano. She asks Iron Man if he can rig an extremely high-pitched sonar device to use underwater. He tells her he can build one and that her plan might work. Five minutes ago at Avengers Mansion, the investigating trio reach the Black Widow's room. The Vision finds a stack of papers and photographs. Some of the papers are part of a dossier about Susan Storm. The rest of the papers are notes on the Widow's behaviors and how to act around the rest of the Avengers. The evidence has revealed the Black Widow as the imposter! Back underwater, Iron Man's sonar whistle is disturbing the sea monsters and causing them to change their path. Atlantis has been spared massive damage with only one tower partially crumbled. Tony decides to see if any Atlanteans have been hurt. Inside the tower, Tony Stark is surprised to find the Black Widow! He puts an air helmet on her and takes her to the surface. The Sub-Mariner, who has witnessed Iron Man's actions, calls Reed Richards of the Fantastic Four. He tells him that they have a problem.